Certified Legal Video Specialist in Chicago. 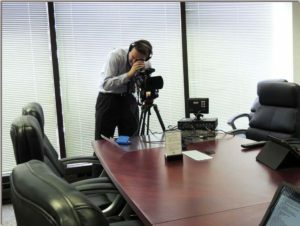 Experienced, certified legal video professional for your deposition in the Chicago city and suburbs. 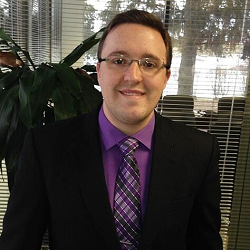 Derek Letellier is a Certified Legal Video Specialist (CLVS) working with Lake Cook Reporting, with offices and conference rooms in north suburban Deerfield, IL near O’Hare Airport and a satellite office/conference room downtown in the Chicago Loop. Letellier, a journalism graduate from Southern Illinois University Carbondale, started working for Lake Cook Reporting in 2012 on a freelance basis. After becoming a full-time employee in 2014, Letellier began recording video depositions that same year. In 2016, Letellier earned his Certified Legal Video Specialist (CLVS) accreditation from the National Court Reporters Association (NCRA). Schedule legal video for your next case. We Listen To You. High definition legal videography provided by Lake Cook Reporting. Go above and beyond for your next case. Discovery Depositions – Great for medical experts and high-profile witnesses. Evidence / De Benne Esse Depositions – For use at trial when a witness can’t appear in person. Synchronized Transcript to Video – Follow the video recording line-by-line with the transcript, create clips of specific testimony, and more. Video editing – For creating key clips, editing out objections as ruled on by a judge, and preparing recorded testimony for presentation to a jury. Picture in picture – Capture computer screens, medical images, annotations, exhibits, witness interactions with documents, and more alongside witness testimony.